"how can there be a wrong way to make good art?" "When a literary critic such as James Wood twists himself into a pretzel explaining exactly why the novel he has under review is the wrong kind of good novel, he sounds like nothing so much as a Railtrack official railing against the wrong kind of snow." David Hare has a lot to say about art and life, fact and fiction. "Art frequently reminds us that things are never quite as simple as they seem. Nor are people. Journalism is life with the mystery taken out. Art is life with the mystery restored." Here's Beth Wellington on Mamet. And Robert Hughes interviews Mamet in the Wall Street Journal. 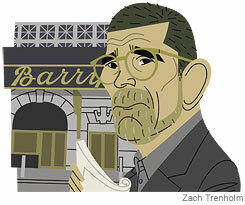 Mamet on plot: "I once worked for a summer laying sod. This is the only thing I've ever done that was harder than that. You've got to get over your own cleverness. You have to become extraordinary analytical, and throw out all the stuff you love to get there. Sometimes it doesn't make sense. You stare at that sheet of paper for years and know there's something hiding in there."